Located in the north, Santa Cruz de Tenerife is the cosmopolitan capital of the island which is a must-visit during your stay in Tenerife. This town is a world away from the main tourist resorts and allows visitors to see Tenerife and its inhabitants in a completely different light. If you like to indulge in retail therapy, Santa Cruz de Tenerife is the place to go. This city offers a wealth of individual shops, boutiques, commercial centres, shopping malls and markets. You can buy absolutely anything you could ever want here, whether that's fresh fruit and vegetables, the latest fashions or a new laptop. Because it’s mainly a residential town and not a tourist resort, accommodation is few and far between here, with many of the hotels and apartments catering towards business people on corporate visits. However, the lack of lodging is more than made up for by the fantastic choice of cafes, bars and restaurants found all over the town. There really is something for every visitor here, with eateries ranging from cheap and cheerful Canarian cafes to elegant and sophisticated restaurants. There is an equally great choice when it comes to nightlife, with a mixture of small budget bars popular with the locals and lively cabaret clubs which feature Latin and jazz performers. One of Tenerife’s most photographed beaches is located toward the north of Santa Cruz de Tenerife. Las Teresitas is known for is wonderfully fine and soft golden sands which stretch on for what seems like eternity alongside glistening azure waters. If you’re not fond of sand but still want to soak up some rays, head to the Parque Marítimo. This popular lido provides plenty of sun loungers and parasols for your leisure, as well as a number of salt water pools to swim in. Spending some time here is like enjoying a day at the beach without the sand. 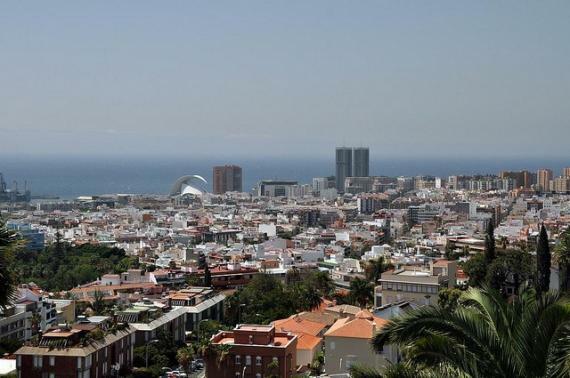 If you’re not a sun-worshipper, there are plenty of culturally-rich things to see and do Santa Cruz de Tenerife, including numerous museums, art galleries, an auditorium, a theatre and the largest park in the Canaries. Although it’s not really a recommended place to spend a week, Santa Cruz de Tenerife is a wonderful place to while away a day or two and offers you a completely different view of the island, in comparison to the major tourist resorts. Find information about selected Hotels, apartments and rooms in Santa Cruz de Tenerife to choose the perfect place for your accommodation.